Je peux.../I can...understand an authentic text about the sport. 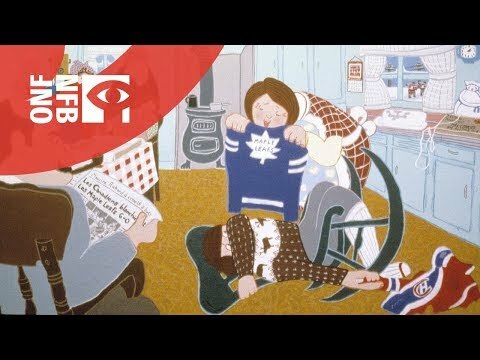 Growing up in Québec, what two things were mandatory? Good snow gear and a horse. Going to church and Saturday night hockey games. A radio and snow shoes. What is the name of the beloved hockey player? What team did the narrator consider the best team in the world? What does 'à la manière' mean? What number jersey did they all wear? The brand of cookies he likes to eat. What is his mother's problem regarding the catalog? They don't have what she is looking for. The catalog is in English and she doesn't speak English. The pictures are not in color. How does she solve her problem? She writes a letter to the company. She fills out the order form anyway. She has her son place the order. What does she hope to buy? A new hockey jersey for her son. How long did it take for the new hockey jersey to arrive? It is not the team of his favorite player. It is the jersey meant for a child. Why does Monsieur Eaton send a Maple Leafs jersey instead of a Canadians jersey? It was the only one they had. Because he didn't understand the letter written in French. Because he is an English speaking Canadian who likes the Maple Leafs. What happens at the rink when he shows up with the rival's team jersey? He gets to play goalie. Why is he sent to church? To thank God for his new jersey. To pray for forgiveness for his anger. What does he actually pray for? To wake up and for this all to be a dream. Lots of moths to come eat his new jersey. More time to play hockey.